In 1950, a woman walked into Harry’s Bar in Venice, Italy, and requested a meal but she had very specific dietary requirements: her doctor wanted her to only eat raw meat. Somewhat taken aback by this unusual request, the chef at Harry’s Bar rose to the challenge and presented the woman with the world’s first carpaccio. The dish was very thinly sliced raw beef arranged in a circular pattern on the plate, and served with a mustard dressing. The owner was so thrilled that he instantly named it carpaccio after the famous Italian painter because the colors were reminiscent of his art. Carpaccio has evolved since the 1950s, and the traditional combination of thinly sliced raw beef and mustard dressing have been politely set aside in favor of raw lamb, raw fish, fruits and vegetables. Proteins and sauces can now be found in combinations like yellow fin tuna dressed with a sesame oil and Thai basil dressing for a southeast Asian flavor or a cured ham and goat cheese carpaccio with a sherry and olive oil dressing for a taste of Spain. For those less adventurous who still want an experience, there are myriad vegetable and fruit combinations to entice your palate. Zucchini carpaccio with a lemon olive oil dressing or melon carpaccio, with a melon liqueur drizzle over top are just a couple of examples. 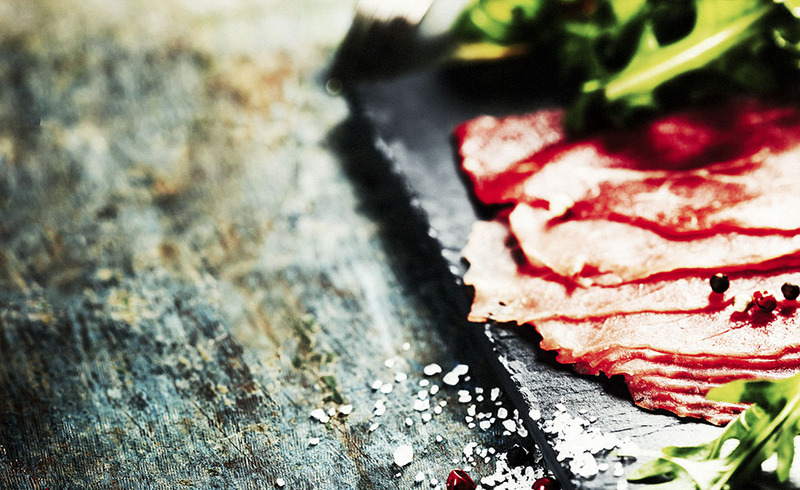 Despite the evolution of carpaccio dishes, a few things remain constant. The protein, vegetables or fruits are always sliced paper thin and are arranged in a pattern on a chilled plate. There is always a sauce of some kind, be it oil based or an aioli, and the raw meat carpaccio is frequently served with micro greens or other leafy greens to elevate the flavour of the dish. While you can certainly find carpaccio on the menus of fine dining establishments, the intrepid home cook can also prepare this stunning dish with a few simple tips. Restaurants rely on professional slicers to slice meat paper thin, but most home kitchens don’t have this kind of tool. Instead, take your meat and wrap it tightly in plastic wrap and then put it in the freezer for about 20 minutes. You want it to be very cold but not yet frozen. Make sure your knife is very sharp. A dull knife will just make a mess of a fine cut of meat. Slice the meat as thinly as you can and if the slices aren’t thin enough you can place the meat between two sheets of plastic wrap and lightly pound it with the flat side of a meat tenderizer mallet. Be gentle though else the meat may tear. Less adventurous home cooks may want to start their carpaccio education with chilled fruits or vegetables. These dishes make stunning and refreshing starters to summer evening dinner parties. They can also be plated ahead of time and left to chill in the refrigerator in order to cut down on last minute preparations. No matter how you slice it, carpaccio in any form is a visually pleasing and tasty dish. Let your creativity soar, perhaps you’ll come up with the next greatest combination of a thinly sliced ingredient and dressing!